It’s on course to be her fastest selling album to date. 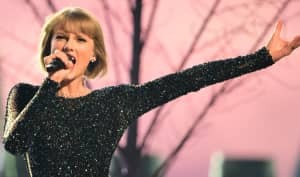 Early sales figures suggest Taylor Swift is on course to break her own chart record with new album Reputation. The album, released on November 10, has sold 1.05m copies in its first four days on sale, according to Nielsen Music figures reported by Billboard. It is suggested that if Reputation continues to sell at such a high speed then Swift will surpass the 1.29m copies her album 1989 sold in a week when it came out in 2014. The pop singer is the first artist to sell a million copies of an album in under a week since Adele's 25 in 2015. Swift optimized sales by withholding the album from streaming services and bundled copies of the CD with tie-in magazines sold for $20 at Target. Plus, as the New York Times reports, fans were told that they stood a better chance of getting tickets for Swift's 2018 world tour if they bought multiple copies of the album. Up to 13 sales were chart eligible as part of the promotion. Swift's last three albums all sold over 1m copies within a week of release 1989 (1.29 million in 2014), Red (1.21 million, 2012), and 2010's Speak Now (1.05 million). Reputation is now 2017’s biggest-selling album in the U.S. passing Ed Sheeran's ÷, which has sold 919,000 since its release in March.